We add the equivalent of one-half teaspoon of Ginseng extract into every serving of this tincture (4 dropperfuls is a single dose). We don’t add any other filler herbs that may or may not actually have the energizing and balancing properties that Ginseng has. 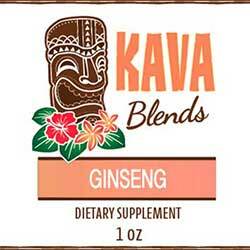 All we have in this award winning Ginseng Kava Tincture Blend tincture is pure Noble Kava root with a 2-4-6 or 4-2-6 Kavalactone lineup, and pure Ginseng extract.